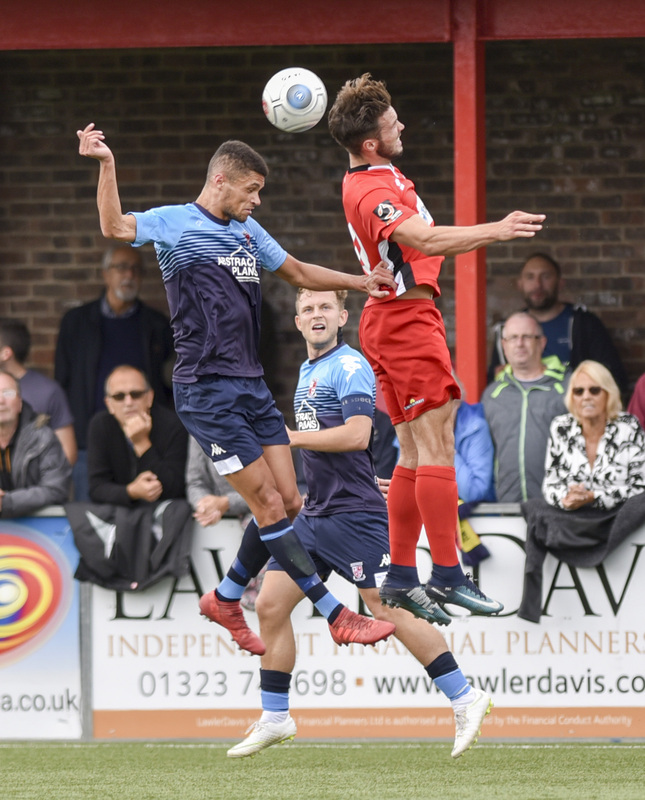 There were dark clouds overhead for the start of the bank holiday match between unbeaten Eastbourne Borough and top of the league Woking on Bank Holiday Monday - but we were spared the howling gale and pouring rain of the Sunday! Eastbourne has a 3G pitch which meant that the surface was very flat and allowed some good football. There was eager anticipation as the winner of the match would be top of the league - with Eastbourne fourth at the start of the game. The typical Eastbourne crowd size is around 500, so the club was pleased to see a lot of Woking fans swelling the numbers to 927, almost double the regular number. Paul Hodges and Kiran Khinda-John were rewarded for good play as substitutes on Saturday's win against Truro with starts, while Gayle was injured and Duane Ofori-Acheampong dropped to the bench. Greg Luer was leading the line for the first time with plenty of skilful 'on the deck' players in the starting line-up. In the Eastbourne Borough team, Woking fans will remember the name Yemi Odubade from his loan period at Woking. Nathan Collier and Kiran Khinda-John from Woking, were recognised as returning after playing for Eastbourne. Woking took the lead early on with a penalty, and dominated the first half but didn’t add to their lead. Eastbourne took the game to the Cards in the second half and scored a breakaway equaliser, but Woking managed a late sharp move to score a second and take the three points. As we have seen several times recently, the match was the proverbial ‘game of two halves’. In the first half, Woking were sharp from the start and if the chances had been converted, the game would have been over by half time. However, it was just 1-0 to the Cards at the break after an early penalty. Paul Hodges looked as though he was running wide of the penalty area but turned to run at the Eastbourne defence and was brought down. In the 5th minute, Max Kretzschmar calmly put away the penalty. It was nine minutes before my notes showed another good attack by Eastbourne from a free kick at the halfway line, but there was no real danger. Woking’s defence was dealing with everything that was heading for them. Yemi Odubade had a good break and got past the Woking defence, but his header was weak and was easily taken by Berti Schotterl. Greg Luer had a couple of nice touches with his back to goal but on 16 minutes, he got clear after a free kick, beating the offside, and Woking fans were sure he would convert, but the shot was saved. On 20 minutes, Hodges combined well with Casey and got a cross in, but there was nobody on the end of it. Perhaps he could have gone for goal himself, but he was having an impact. A resulting cross threatened again, but Ferdinand’s header was wide. Eastbourne then tried some efforts and at the halfway point of the half, Sergio Torres, who caught the eye all game for his football as well as his haircut, got a good shot in from the right hand side, but Schotterl saved it well. In the 26th minute, there was a quick throw-in from the right hand side and an attack from Woking with Kretzschmar and Hodges combining well. However, Eastbourne reacted well and in the resulting break, Odubade might have been in but Khinda-John got the ball away. On 31 minutes, Woking again went close after a good move by Wheeler, who put in a good shot that was blocked. That was followed by another dangerous attack which was stopped by an offside decision, with Armani Little close. At 38 minutes, Collier got in a robust challenge that allowed Little a left foot shot from outside the box, but it went just wide of the post. This was followed by a period with two or three chances for Eastbourne, but after two minutes of extra time the teams went in with Woking perhaps feeling that they should have been at 2-0 or 3-1. In the second half, from the off, and with Woking kicking into the strengthening wind, the first chance fell to Woking with Wheeler passing to Luer who almost put Kretzchmar in for a headed chance. At this point, there was a shift in the balance of play and Eastbourne started to force themselves back into contention. Hamilton, the Eastbourne goalkeeper, got almost to the halfway line before launching a ball forward – a move he repeated a couple of times, unchallenged, in the second half. In the 54th minute, Eastbourne got a corner and put in a good header, but Schotterl got a hand to it to tip it onto the post and the ball was knocked away for a corner. He hit another cross away and then got in a punch from a corner before Torres hit a shot wide. Woking started to press, but Eastbourne got a great break from a Woking corner. At 63 minutes, Odubade got the ball just inside the Woking half and was very direct in his surging and rapid attack. He ran at the heart of the Woking defence and, at the last moment, passed to Wills on his left, cutting out the Woking defenders, who were struggling to get back. Wills made no mistake in his shot and that brought the score to 1-1. Eastbourne continued to dominate and the Woking defence had to dig deep, although there weren’t very many real frights over the minutes immediately following the goal. On 70 minutes, Dawes, widely regarded as Eastbourne’s sharpest forward, got a shot away, but it was turned past the post by Schotterl. At 72 minutes, Dowse took Hodges off and brought on Reggie Young. Woking remained under pressure and a couple of minutes later, a slick move by Torres and Hamilton led to another corner for Eastbourne and the headed clearance only meant another corner. My notes then say that for several minutes, Woking were ‘under the cosh’ with Schotterl punching another good shot away. At 79 minutes, Kretzschmar finally got a good cross in, but there was nobody to exploit it. The ball then went rapidly to the other end, where Schotterl made Woking fans nervous by nearly missing an important tackle . The ball was quickly recycled to the other end, to Luer, but his shot flashed across the goal. Eastbourne countered and felt they had strong reasons to claim a penalty for a tackle in the box, but Mr. Howard, the referee, didn’t agree, leaving home fans frustrated as they thought it looked like the incident that had led to the early Woking penalty. At 82 minutes, Young finally got the chance to make an impact and beat the full back, but his cross didn’t find a teammate. At this point, having ridden out the storm, the Cards were finally beginning to get back in the game. Eastbourne brought on Martin for Ryan Hall. Eastbourne then had a good chance, when Collier slipped in the area, after an otherwise excellent performance, but fortunately, the shot went over the bar. Just four minutes from full time, Wheeler got the ball back to Kretzschmar, who put in a curling cross towards the far post. Ferdinand got his head on it and the ball nestled in the bottom right corner. Eastbourne 1, Woking 2! Eastbourne replaced Lloyd Dawes, widely viewed as a key Eastbourne player, and suggesting a change to ‘Route 1’ football, with Ian Simpemba (the proverbial ‘big unit’). That change led to a period of sparring that saw neither side achieve fluency. So, a good performance by the Cards, who rode their luck at times, but a match that showed the value of a strong defence. However, it also showed a lack of ruthlessness in the final third of the pitch. The referee and team were good and the game was played in a great spirit, with no bookings on either side. Eastbourne fans told us that it was the best game at Priory Lane for some time. Man of the Match: At half time, there was no obvious Man of the Match candidate, with a lot of good performances. However, Max Kretzschmar scored the penalty, laid on the second and made a key tackle in his own penalty area when tracking back in the second half, so by the end, he was the clear winner.